AFLW: An emotional loss Defender Nicola Stevens speaks with Collingwood Media following her side's loss to Brisbane, and looks ahead at what's to come against the Western Bulldogs at the Whitten Oval on Saturday night. Sarah D'Arcy has been one of Collingwood's best in the early stages of the AFLW season. It’s taken only three games for Collingwood’s Sarah D’Arcy to cement herself as one of the most exciting, young key forwards in the AFL Women’s competition. And while coach Wayne Siekman and the club knew the type of player they were recruiting when they drafted the Victorian with pick No. 22 last October, the rest of the football world has only just started to give the hard-running centre half forward the respect and attention she deserves. Originally from Healesville, like many young kids, D’Arcy was introduced to football through her local Auskick program. But without knowing girls could go on to play amateur football, she switched to soccer, before returning to play footy with the under-14 boys at Healesville Football Club. After playing only two games, D’Arcy was told she was too old to compete, and before she knew it, she was lining up for the Yarra Valley Cougars only one week later in the senior women’s division – as a teenager. Before coming to Collingwood, the 25-year-old became well known for her senior career at premier division VFLW team, the Eastern Devils. “I played with Lauren Tesoriero at the Cougars for one season, and then she went to the Devils. Three years later, I followed her there, and now we’re together at Collingwood again,” D’Arcy told Collingwood Media this week. During her time at the Devils, D’Arcy represented both Melbourne and the Western Bulldogs in women’s exhibition games, and kicked an impressive 30-goal season tally while playing at half forward. But nothing has come close to the moment she found out she was drafted to the Pies. “There’s a video capturing my reaction which is great, because I loved that day so much, and now I can go back and remember how it happened. “She possesses an outstanding work rate and she competes time after time. She is your classic hit up forward that will keep presenting all day and has an incredible set of hands,” he said in October. VIDEO: Chiocci goals after the siren. And while friends and family were overjoyed with the announcement, it took one family member a little bit longer to adjust to the news. “My dad is a diehard Richmond fan, so he didn’t cope with it too well at the beginning,” D’Arcy joked. After a rigorous two-month pre-season and only three AFLW matches, D’Arcy has already repaid the faith of her coaches and club for choosing her with their third selection in the draft. In what has been a challenging start to the season for the Magpies, D’Arcy has been one of the standout performers for team, and in the competition. Across the first three weeks, D’Arcy leads the team with 39 disposals, has 10 marks and one goal to her name; and almost single-handedly propelled Collingwood back into the game last-week with an inspiring third-quarter performance in trying conditions. Having been likened to Adelaide’s Josh Jenkins in the way she plays the game, D’Arcy says another renowned forward has also had an impact on her approach to professional football. “My marking has always been one of my strengths in my game. But in previous years, my fitness has let me down. I now have full confidence in my body to run out the full match and still perform at a high standard. The popular No. 4 credits her teammates for her impressive start to the season, in particular her partner in crime in the forward half, Moana Hope. VIDEO: Sarah D'Arcy stars up north. “I give her so much credit to how I’ve been playing lately, because her knowledge, passion and direction to us younger forwards has been incredible. “I absolutely love playing with her, and I’m excited to see her have a breakout game soon because she deserves it. Speaking of teammates, D’Arcy came to the Holden Centre with five fellow Eastern Devils – including Sophie Casey, Kendra Heil, Meg Hutchins, Lauren Tesoriero and coach Brendan Major (now assistant coach at Collingwood). And while it may have made the transition to Collingwood that little bit easier, D’Arcy says seeing the Devils represented on the big stage has been the best part about it. “For example, Adelaide’s Sarah Perkins – she was our full-forward at the Devils, and we played together a lot over the years. Playing for Collingwood, a quieter D’Arcy knew media coverage and large crowds would be just be another part of the job. But with a rising profile on and off the field, the Magpie Army have started to take notice of their enchanting key forward. And if you thought her life on the field was busy, just wait until what you hear what she gets up to off it. VIDEO: Jess Cameron snaps the first. 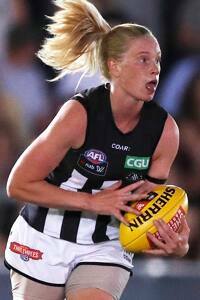 As for on the field, D’Arcy says she just “wants to start winning games of footy”. This week, the Pies travel down the freeway to VU Whitten Oval for a Saturday night must-win game against the Western Bulldogs. Back on Victorian soil this week. We're off to the Kennel.